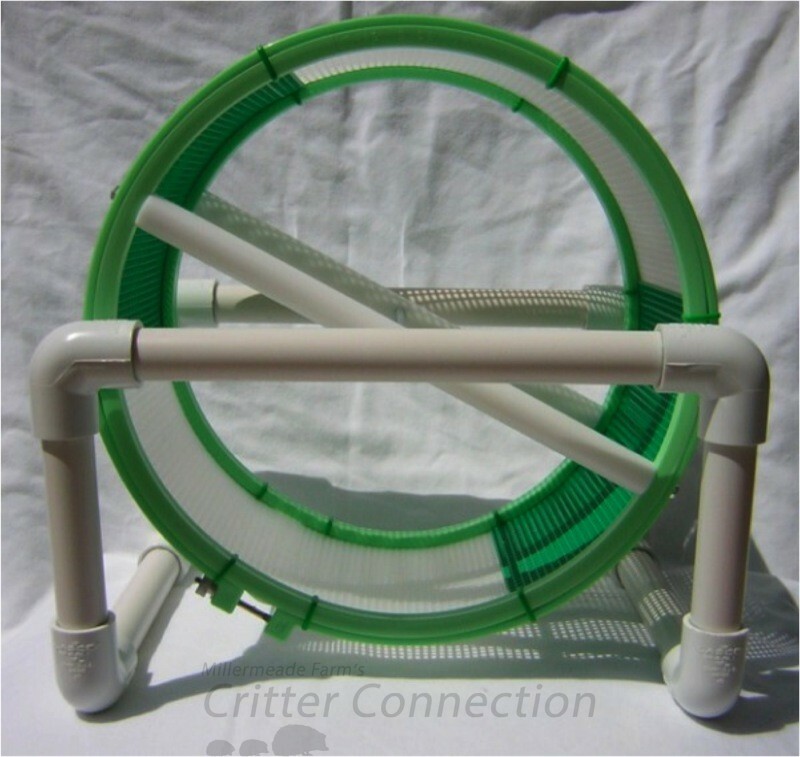 Wheels are an excellent addition to any cage and are one of the most important accessories to provide stimulation since most hedgehogs love to run in a wheel. Our customers have measured their hedgehog’s wheel activity and have reported up to 12 miles logged on a pedometer in one night. Wheels provide important exercise for your hedgehog. Exercise increases the overall health and well being of animals and humans alike. Hedgehogs that are provided wheels have a decrease in fatty liver disease and other obesity related health complications. Hedgehogs need a relatively large wheel. 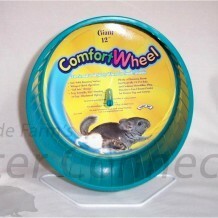 Wheels that are sold for large rats, chinchillas, or ferrets are generally the right size. 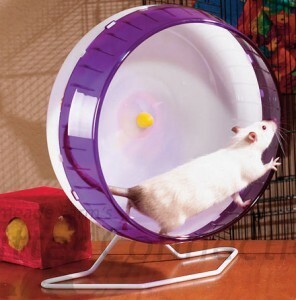 Wheels should have a SOLID bottom or a plastic mesh running surface – no wire rung, rodent-style wheels, etc. Make sure you use the 11” to 15” diameter wheels with approximately 5” of running width. The smaller 10” wheels are only acceptable for smaller than average adults or youngsters. Most wheels need a 16” cage height clearance. 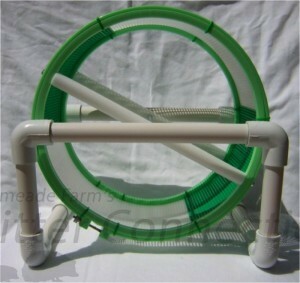 Wheels with a sturdy stand tend to be a little quieter and are less likely to be tipped over or pushed around the cage. Keep in mind that there is no PERFECT wheel. Each owner and hedgehog tends to have their favorite to use and favorite to clean. 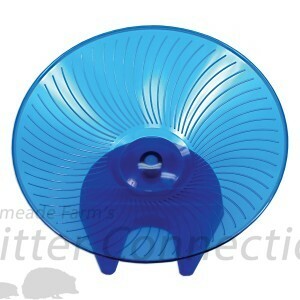 You might need to try several wheels before you find the right one for you and your hedgehog. Giant Comfort Wheels are economically priced, reasonably easy to clean, and readily available. Their tread provides traction for the hedgehogs, but they are a little harder to clean than the bucket wheels. The axle of this wheel is made of plastic, and plastic on plastic can make quite a racquet. Adding KY Jelly to the axle will reduce friction, which will decrease the noise and increase the longevity. Hedgehog wheel-a-holics will wear out the plastic axle pin, so they are not as durable as other options. Rare instances of a wheel falling over and hurting hedgehogs have been reported. Most hedgehogs will simply lift up a fallen wheel and crawl out from under it. Secure the wheel to the side of the cage if you notice your wheel falling over. A heavy hedgehog may warp this wheel. 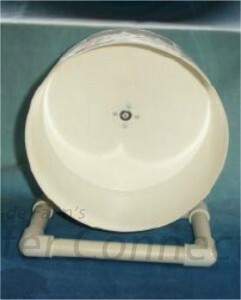 The Flying Saucer Wheel is popular because it is safe and quiet. The solid running surface is safe for toes and it has small ridges for grip so that it is not as slippery as a smooth surface. It has a stainless steel axle and an acetyl plastic hub. Shelly at Beach Bum Hedgehogs makes and uses these plastic mesh wheels. We discussed the Chumba Spool Wheel. She stated that has not had any issues with nails/toes getting caught. She likes the fact that mesh wheels have tiny holes in them because when the hedgehog tinkles, it goes through the wheel instead of flinging on their back. This wheel is good for BIG runners as it has give to it and provides some shock absorbency. These wheels are whisper quiet – no squeaks during the night! Pictured is the Chumba Spool Wheel, specifically the Acheron frame. 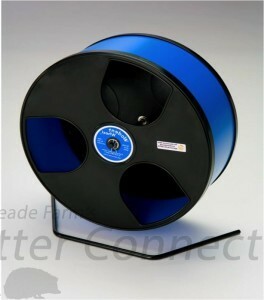 Bucket wheels are popular because of their durability, easiness to clean, and reasonable price. Most bucket wheels are far less noisy than other wheels because most are made with ball bearings and therefore do not have metal or plastic axles that can squeak or grind. This type of wheel is one of the easiest to clean because it has a smooth surface. Lining the wheel with Glad Press n Seal not only aids in cleaning, but also provides a little more traction. You can make bucket wheels at home with some time, some simple tools, and the right parts. Bucket wheels have been used by hedgehog enthusiasts for a number of years but are somewhat difficult to find because all are made by hand. Many bucket wheels are made with roller blade bearings that can get rusty and “stick”. It is important to use care and to keep the bearings completely dry. Silent Spinner Wheels are slightly higher priced than the Giant Comfort Wheels and are made by the same company. The reason for the higher price and the “silent” portion of its name is that the wheel spins on a ball bearing rather than a plastic spoke. The bearing design also improves the longevity of this wheel. We’ve seen mixed reviews of the ease in cleaning this wheel. Hedgehog owner Leigh Ebling prefers the Silent Spinner to the Comfort Wheel. She says it is definitely worth the extra money. She can sleep and he can run. 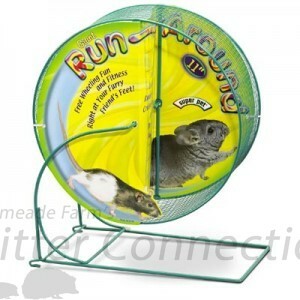 Plus her hedgehog runs so fast that the Comfort Wheel would pop off the side of cage. The 12 inch ‘Wobust’ Wodent Wheels are popular because they are somewhat enclosed and some hedgehogs prefer to wheel in private. These wheels need to be unassembled for each cleaning. This may become quite a burden if your hedgehog chooses to use the wheel as the litter pan. 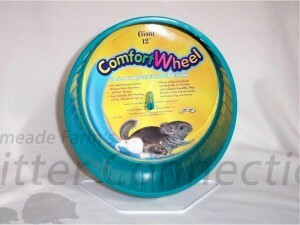 These wheels are designed for and best used by rodents. The hedgehog’s little feet may get caught in the rungs of wire wheels. Hedgehogs have been known to scrape, bruise, or break their legs or feet in wheels with spokes if not properly lined. Mesh wheels are a little less dangerous, but nails and toes can still get caught if nails are not properly trimmed. Wire and mesh wheels may be covered with craft plastic or craft foam. These plastic covered wheels are much safer than uncovered wire wheels but can be difficult to clean. The sidebars of these wheels are also dangerous to the unsuspecting hedgie that looks out the side. Some less careful hedgehogs have been known to get a good thump on their nose with the side bar if they try to look out the side without coming to a complete stop. Wire wheels tend to be the squeakiest of all wheels. Plastic wheels such as the Comfort Wheels are better, but the Cake Walk and bucket wheel are the quietest of all. One remedy for squeaky wheels is a small amount of vegetable oil applied to the axel. Vegetable oil is safe and readily available in most homes. Other hedgehog owner’s find that petroleum jelly (KY Jelly) lasts longer and works slightly better. Some hedgehogs can be classified as “wheel-a-holics”. These hedgehogs wheel endlessly for hours at a time and at amazing speeds. Wheeling is great exercise, but like other obsessive-compulsive athletes there is a point where too much exercise can be harmful to the body. Hedgehogs can usually self-regulate themselves, but we know of several instances where the hedgehogs wheeled to the point of making themselves physically sick. Hedgehogs that burn lots of calories on the wheel may need a higher fat content in the diet to make up for burning up so much energy on the wheel. Just as human athletes can damage joints, tendons, or muscles, our hedgehog friends can do the same due to the repetitive nature of the sport. Some hedgehogs take a little while to get used to the idea of using a wheel. Babies especially may need a little time to become accustomed to their new surroundings and wheel. The best way, we’ve found, to teach a hedgehog to use a wheel is to wait until your hedgehog is awake and very active and one can place your hedgehog on the wheel. Hold one hand in front of the wheel like a gate and gently move the wheel to help demonstrate wheel movement. When your hedgehog is alert and curious it will likely try the wheel itself to see what it is all about. You might have more luck teaching your hedgehog to wheel in a play area first rather than in its cage. Sometimes people mistakenly think their hedgehog isn’t using the wheel when in reality the hedgehog is using the wheel at night when no one is watching. A good way to check wheel use is to mark a certain spot on the wheel and see if the mark has moved in the morning. Some hedgehog owners put an extra fine sandpaper liner in their wheels or buy specially made wheels to trim their hedgehog’s nails. However, there are a few problems that one might not have considered when using these products. Hedgehogs tend to run on the pads of their feet rather than using their nails to dig and grasp. The trimmer will only work on very long nails, but can injure the hedgehogs’ feet in a relatively short period of time. Another serious problem to consider with using sandpaper in the wheels is that the combination of pooping on the wheels and possible damage to delicate feet is very bad. Potential life threatening infections can result from poop being essentially ground into a wound. Most experienced hedgehog owners do not think sand paper is a good idea even for the hedgehog that is the most uncooperative at nail trimming time.